Mercedes wasn’t number 1? You’re kidding. Who was? Lexus and Kia? 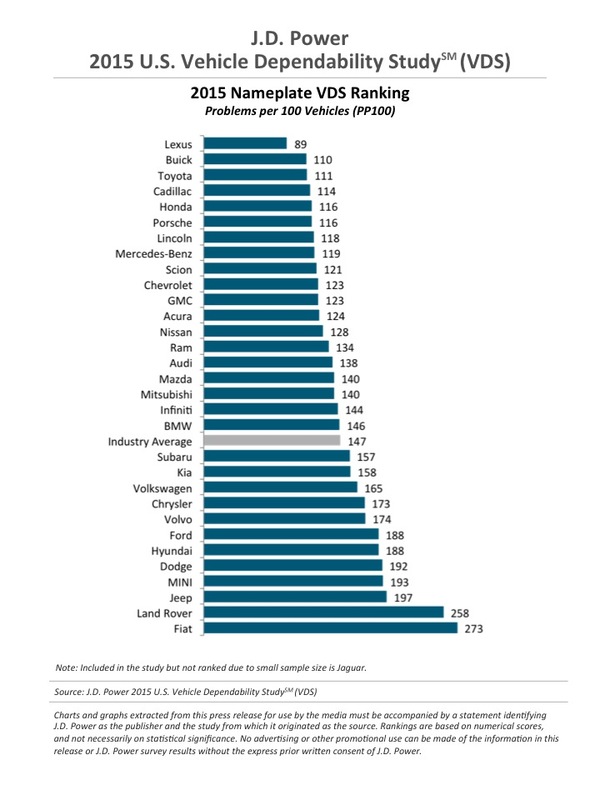 Eh…they run fine but there are other measures of a vehicle beyond reliability and initial quality. That’s what those of us who have drank the Mercedes-Benz Kool-Aid tell ourselves. And we’re right, naturally. 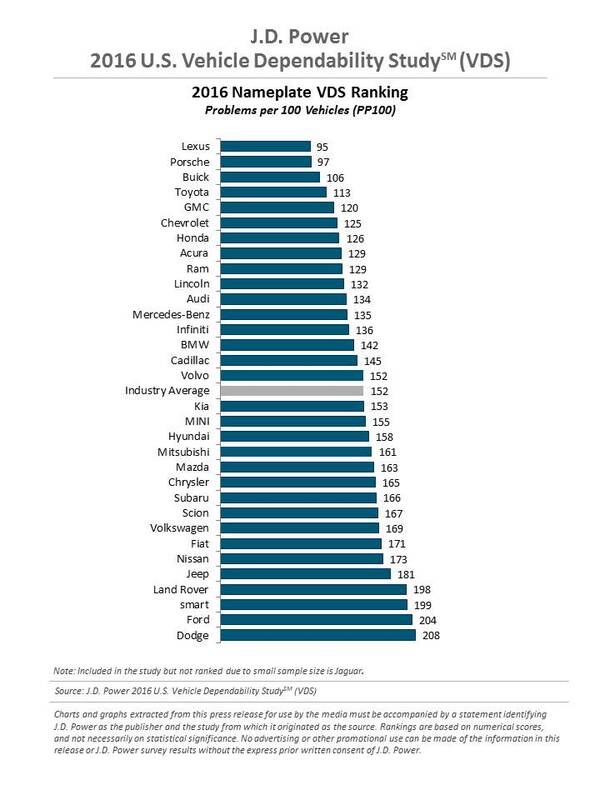 Of course, if Mercedes was ranked number one we’d probably say, well, the research is just telling us what we already know and we wouldn’t question the results of the study in the slightest. J.D. Power thinks they know better. Who the hell is J.D. Power? James David Power was born in 1931. He was obsessed with marketing, data, and statistics (we assume) since he founded the marketing firm J.D. Power and Associates in 1968, studied finance at Wharton, was a financial analyst at Ford, and a marketing consultant for GM and J.I. Case among other thick black rimmed glasses and pocket protector positions over his career. Immediately upon forming his own marketing firm J.D. started conducting quality and customer satisfaction research, the company has been doing it ever since. J.D. is still with us too, btw, speaking and teaching classes on marketing after selling his company in 2005. The two studies J.D. 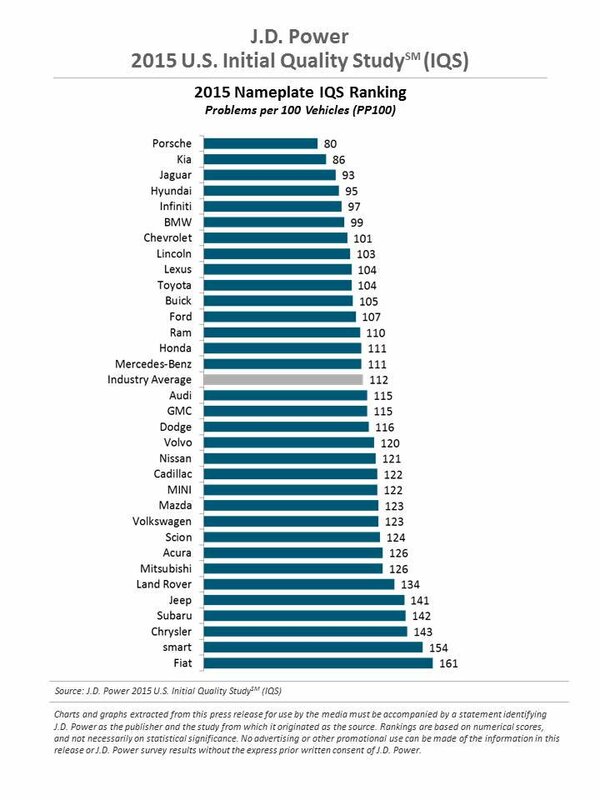 Power publishes each year that pique the interest of the auto industry and consumers interested in buying vehicles..or just those of us obsessed with them are the VDS (Vehicle Dependability Study) which measures problems over three years of ownership and IQS (Initial Quality Study) that measures issues within the first 90 days of ownership. There are other studies J.D. 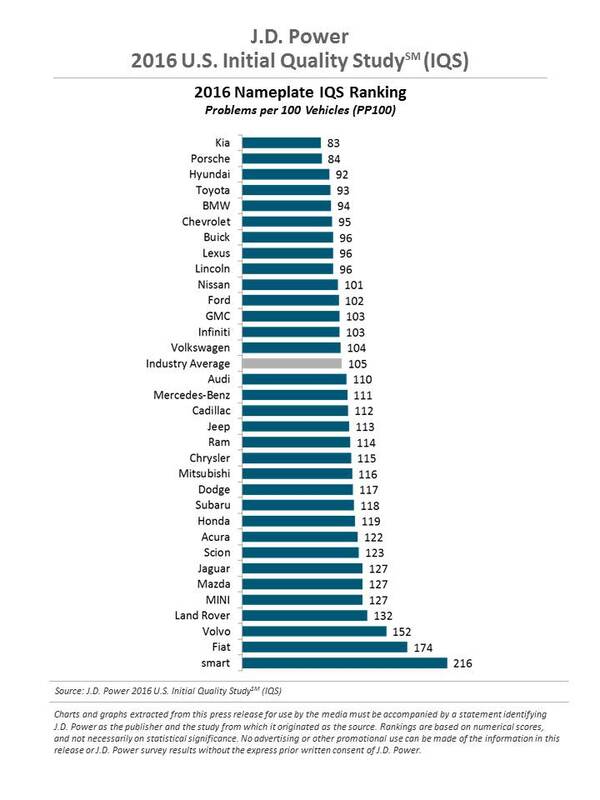 conducts that are auto related such as the APEAL which studies consumer attitudes and dealership surveys, but the VDS and IQS could be considered the “big ones”. So how’d we (MB folks) do? For 2017 there are 31 automotive brands ranked (keep in mind some manufactures produce multiple brands) in the Vehicle Dependability Study. The Initial Quality Study has 32 brands evaluated. That extra in the IQS is Genesis. The luxury brand of Hyundai Motor Group. In the IQS MB pulled off a ranking of 102 which put it in a 17th place tie with Chrysler. The longer-term VDS has Mercedes ranking in 5th place with a score of 131. 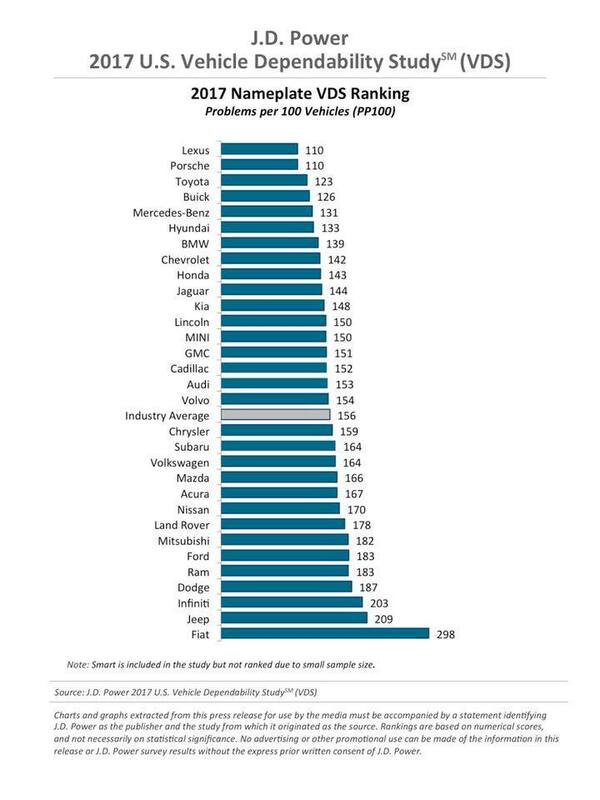 The 102 and 131 numbers represent problems per 100 vehicles. This means in the first 90 days of ownership a new Mercedes owner, on average, would experience 1.02 problems and over 3 years 1.31 issues. That’s not bad. 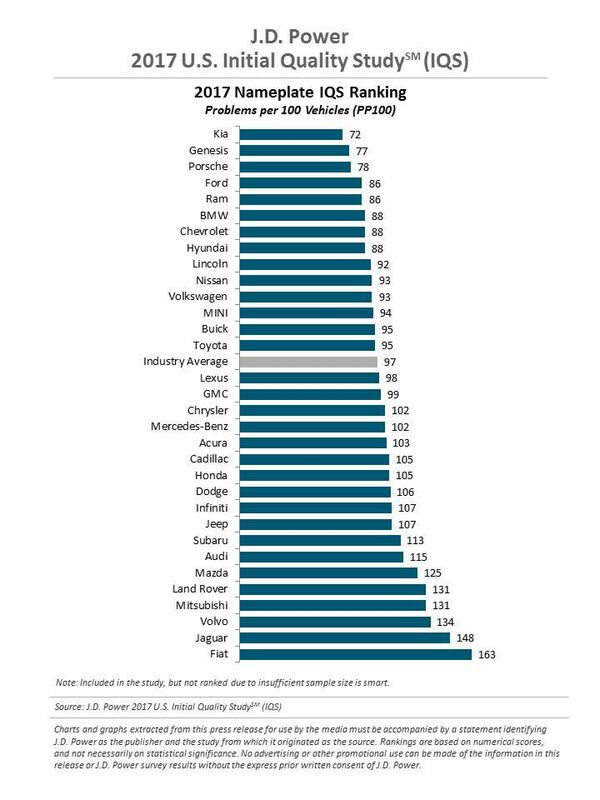 The other consideration to take into account with these rankings is that certain cars like Mercedes that have high levels of technology and features. These can create perceived issues due to owners not understanding how to use certain features and assuming they are not working or broken and taking their vehicles in for repair. If you’re interested in seeing how Mercedes stacked up this year vs the previous couple years below are the J.D. Power VDS and IQS reports from 2016 and 2015.